An emergency is serious business. It that shouldn’t be taken lightly. It doesn’t matter why, how or when one arises; you have to act swiftly. When it comes to a dental emergency, time is of the essence. It’s the difference between saving a tooth and having it replaced. A dental emergency can happen in many different ways and can be a scary experience for the affected person. We’re here to calm any fears you may have. Virginia Beach dentists, Dr. Stephanie Santos and Dr. Vinita Folck, want you to act accordingly, yet quickly, when a dental emergency arises. Our staff in Virginia Beach, VA is ready to help in any way we can. When it comes to dental emergencies, the dental office Virginia Beach calls on is Smile By Design. Is It A Dental Emergency, or Just Normal Pain? Deciphering whether or not you’re experiencing a dental emergency is important. What you may think is a major problem could turn out to be an ordinary toothache. That pain or sensitivity you feel can come on suddenly, and you may need immediate dental care. We’ve seen plenty of dental emergencies come through our office, but there are a few that are the most common. Lip/tongue bite leading to excessive bleeding: Clean the area and apply a cold compress to temper the swelling. If bleeding is uncontrollable, you need to go to the emergency room. Broken/cracked tooth (teeth): Until you can come in for an appointment, rinse your mouth with warm water and apply cold pressure outside of the affected area. Injury to the jaw: You’ll know if you have a broken jaw (hint: major pain). Be sure to apply cold pressure to the damaged area and immediately see us or go to the emergency room. A tooth that is loose: A dislodged tooth can cause major problems. We’d suggest taking an over-the-counter pain reliever and apply cold pressure to the area before coming in for immediate treatment. A tooth that’s been knocked out: Time is important. You can try reinserting the tooth into its socket, but if you can’t, see us immediately. The ADA recommends placing the tooth in milk for its preservation purposes. Lost crown or filling: When this happens, put the filling or crown in a safe place and call us right away. Speak with us first before trying to alleviate the pain. Swelling that hurts: Excessive swelling is usually a sign of an abscess tooth. This infected pocket of pus can cause major dental problems quickly. Rinse your mouth with saltwater (It’s gross, but it works!) for temporary relief from the pain. 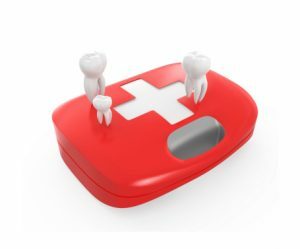 Some, not all, dental emergencies can be fatal if not properly treated. It’s important to see us whenever a problem arises, especially when a dental emergency is involved. Remember, the earlier you seek treatment, the better your lifestyle and dental health can improve. Dr. Santos and Dr. Folck are the dentists Virginia Beach, VA residents can turn to when a dental emergency hits. We also serve residents in Lynnwood, Salem, Norfolk, Bayside and beyond. Comments Off on How Do I Handle A Dental Emergency?